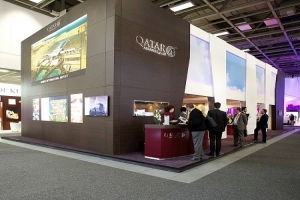 Qatar Airways is set to participate in ITB Berlin 2014, the world’s leading travel trade show for the sixth year in a row this coming week: the five-star airline is welcoming attendees of ITB Berlin to visit its newly redesigned booth from March 5-9, at Messe Berlin. Situated in Hall 22B, the Qatar Airways’ booth covers a total area of more than 250 square metres set across two levels, where guests can sample the five-star on-board cuisine served on Qatar Airways Business Class flights, and try out the interactive features of the airline’s latest products. Visitors will also be treated to entertainment highlighting upcoming destinations for 2014 including Edinburgh, Miami, Dallas and Larnaca. Airlines typically use ITB as an opportunity to showcase new products and services in front of a large, international audience. During this year’s ITB, Qatar Airways will focus on new destinations, the addition of the A380 and A350 to its fleet, as well as the opening of the much anticipated Hamad International Airport. Eight new destinations for 2014 have already been announced with flights commencing this last weekend to Sharjah, UAE (March 1) and Dubai World Central, UAE (March 1) followed by; Philadelphia, USA (April 2); Larnaca, Cyprus (April 29); Istanbul-Sabiha Gökçen, Turkey (May 22); Edinburgh, Scotland (May 28); Miami, USA (June 10) and Dallas / Fort Worth, USA (July 1). "The opening of the new airport will represent the culmination of our expansion strategy for 2014. It is the first airport in the world that offers full flight operation of all commercial aircraft, including the Airbus A380, the largest passenger aircraft in the world. With it, we will continue to strengthen Doha’s position as an important global hub. I look forward to a successful trade fair in Berlin," said His Excellency Mr. Akbar Al Baker, Chief Executive Officer of Qatar Airways. Berlin is one of three Qatar Airways destinations in Germany, and is one of the airline’s most important markets. Qatar Airways increased capacity on its Doha-Berlin route starting December 1 2013, with the introduction of the A330, due to strong passenger demand.